Considering trading in four wheels for two? Here is everything you should consider. Driving a car every day is the norm for many Americans. You can get to a destination quickly and shield yourself from the elements. But driving also comes with drawbacks, such as navigating through traffic and producing major pollution. Many individuals, especially those living in bikeable cities like Seattle or San Francisco, are choosing bikes over cars. In fact, more than half of recently surveyed millennials prefer bikes to cars, saying the ongoing costs are not worth the financial burden. While biking continues to grow in popularity, you should weigh the pros and cons to see if it’s right for you. Ditching a car for a bike is a significant shift for most drivers, but it offers many benefits. Get fit. Bicycling is an incredible workout that burns between 32 and 59 calories per mile depending on your biking speed and body weight. In addition to burning calories, riding a bike also strengthens your leg muscles and upper body. 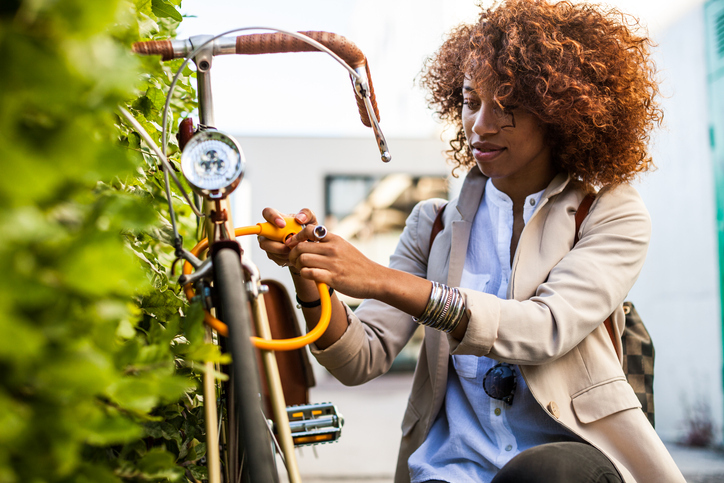 Individuals who struggle with finding time to exercise would benefit from biking to work instead of driving, where virtually no calories are burned. Improve overall wellness. Physical fitness isn’t the only important component of an individual’s well-being. Mind and spirit also matter. Bicycling is a great way to relieve stress and anxiety, which leads to increased happiness and satisfaction. Some experts also say active bicycling lowers blood pressure, improves circulation, and eliminates insomnia and other sleep disorders. For those with health concerns, ask your doctor if daily bicycling can help. Help the environment. These days, “going green” is more than a trend; it’s a value for many Americans. By riding a bike instead of driving a car, individuals eliminate a significant portion of their carbon footprint because riding a bike doesn’t release carbon dioxide into the air. In addition, bikes don’t wear down the roads, cause potholes or drip fluids as a car does. If the well-being of the environment is a primary concern, then riding a bike is an eco-friendly alternative to driving a car. Forgo auto insurance. Car insurance premiums vary, depending on your state and driving record, but they’re typically one of the most expensive costs of owning a car. In California, for example, drivers pay $1,665 per year on average for car insurance. Forgoing this payment means saving significantly. And if you are interested in insuring your bicycle, check your homeowners or renters policy first. You may be able to make a claim if your bike is stolen or damaged by a natural disaster listed in your policy. A separate bicycle insurance policy is an option, but these are typically only recommended if your bike is worth more than $2,000. In this case, policies may cost as little as $117 a year. Pay less for ongoing maintenance. On top of auto insurance, ongoing maintenance and repairs can quickly add up for car owners. Depending on the repair, bicycles typically don’t cost much to fix. For example, replacing a tube on a flat bicycle tire costs about $6, compared to replacing a car tire, which could cost more than $100. And while the life span of both a bike and car eventually come to an end, the cost to buy a new bike is substantially lower. Gain freedom. This is often not a benefit many individuals consider. Instead of moving through slow traffic, bicyclists can move freely and take more shortcuts. This is especially important during afternoon traffic jams.